Tessa Kruczek (10) performs an original song at Open Mic Night. On Friday, Mar. 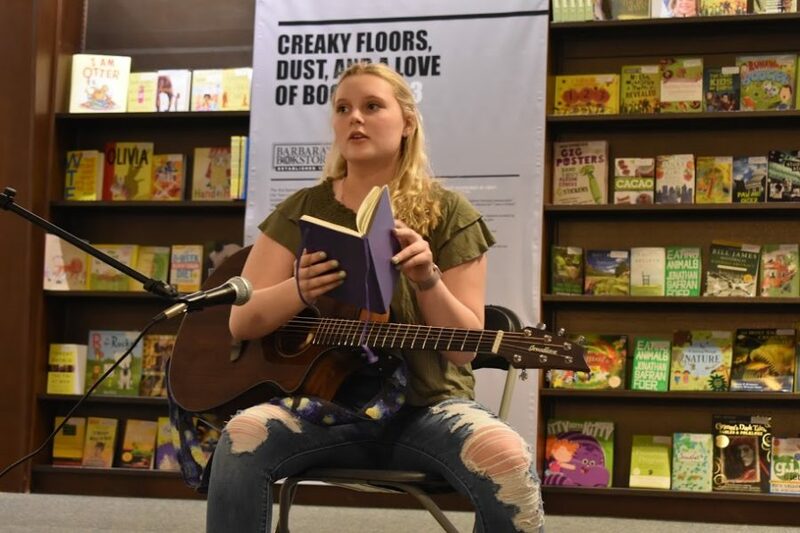 8, Whispers, the literary magazine at VHHS, along with the literary magazine at LHS, held the first ever Open Mic Night for VHHS and LHS students at Barbara’s Bookstore in Hawthorn mall. About 25 students from LHS and VHHS presented poetry, raps, music, or essays, and more than 100 people came to the event. Most of the crowd was made up of students, with some parents and teachers. “I loved seeing the creative side to a bunch of people from school, and I didn’t expect such a huge turnout. This event was really cool!” Lily Parikh (11), a student that attended the open mic night, said. Students from VHHS and LHS were encouraged to read a piece they’ve written, perform a song or engage in another form of creative expression. Students presented a fair mix of things and there was even a special performance by the VHHS Improv Club. “This is an event to celebrate student writing and other modes of creative expression,” Ms. Abood, one of the Whispers faculty advisers said. This is the first time VHHS has hosted anything like this, and the idea came from a group brainstorm Whispers had at the beginning of the year. They suggested it as a way to gain publicity for the club and celebrate the creativity of students and staff. When considering where to hold this event, they felt most open mic nights were at coffee shops or bookstores. Barbara’s Bookstore seemed like the perfect option, since it’s halfway between VHHS and LHS, and makes for a more relaxed vibe than school. Whispers relied on the school announcements and flyers to get people interested and aware. Many teachers also encouraged students to submit work from a class. Sneha Akurati (12), a student that shared an essay she wrote, said she was never planning to participate, but was persuaded by a teacher. “After sharing my essay with my Social Justice Lit Class, Ms. Young suggested that I read my essay at Open Mic Night,” Akurati said. According to Micah Kim (12), a Whispers member, they would love to have another open mic night, or even make this an annual event. Whispers meets and looks at the submissions of writing and artwork from students. They pull them together and publish a magazine in April or May. “Ms. Macias and myself are the sponsors, and we have a group of around 7-11 students who meet either every week or every other week,” Abood said. Their main goal is to publish a literary magazine to celebrate creativity and student voices. Whispers said they love submissions from any student, and that they encourage people to submit poems, song lyrics, short stories, excerpts from longer works and all forms of artwork.